Is This The Final Flat Hike? 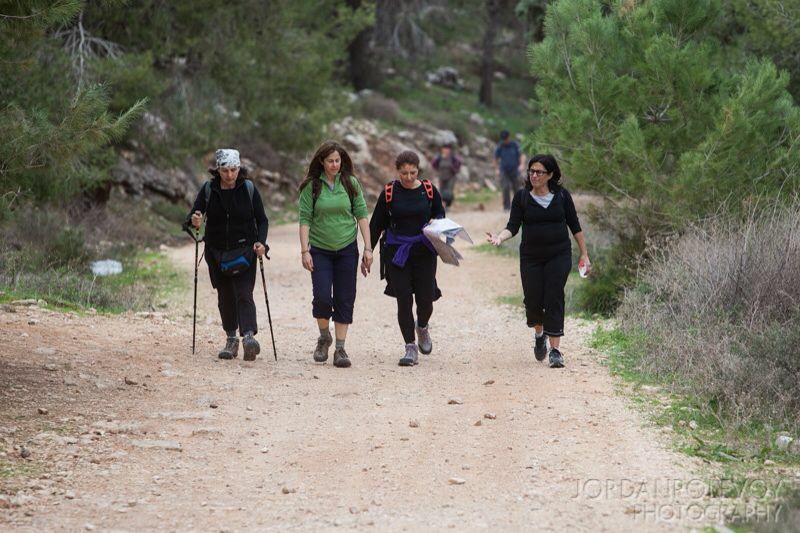 We picked up the Israel Trail just past the Sharonim Mall, a few meters past route 40. Temperature-wise, the weather was perfect for walking, although the sky was cloudy all day ("Oh, what a beautiful morning...") which was not a bad thing since there was very little shade during our trek. Two minutes onto the trail and we found ourselves having to cross water. As always, it comes unexpectedly and, as usual, it's freezing cold. Luckily, we had passed a grove of bamboo, which provided "hiking poles" to steady us over the slippery rocks. 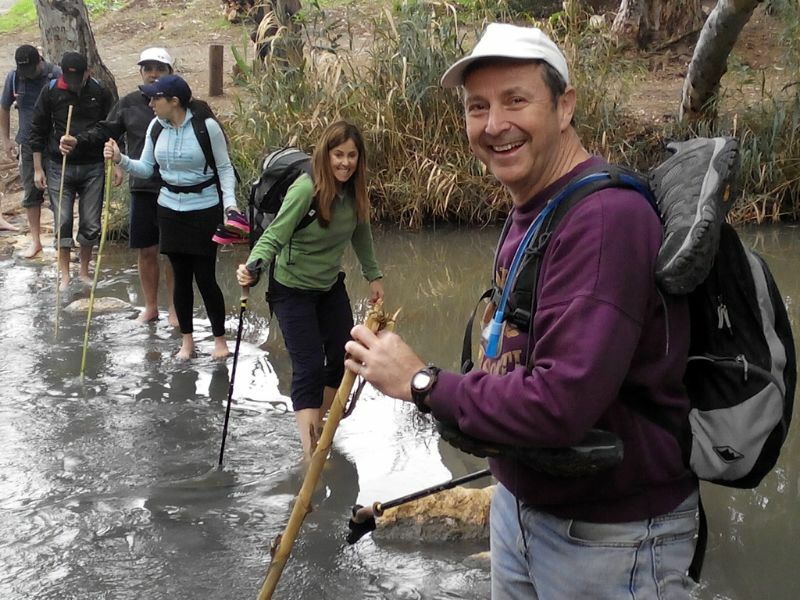 The first few kilometers seemed to take us in a circle along the Nahal Yarkon. We met up with the state ecologist in charge of that section of the river. He confidently told us the water, though murky looking, was clean enough to drink. A little farther on we came upon Beit ha'Beton, The Concrete House. Built in 1912, it was the first house in Palestine to be built out of concrete. We passed the ha'Nofrim pool -- a small nature reserve that has a large pond filled with water lilies and is sometimes a bird sanctuary. We skirted the edge of the Tel Afek forest. Tel Afek was built by Herod the Great, and named in honor of his father, Antipater II of Judea. It's between Caesarea Maritima and Lydda, two miles inland, on the great Roman road from Caesarea to Jerusalem. The city was destroyed in 363 CE by an earthquake Currently, the site of Antipatris is included in the national park "Yarkon-Tel Afek", incorporating the area of the Ottoman fortress, the remains of the Roman city and the British water pumping station. The trail then took us under road 483, and along the edges of bright green wheat fields. We followed the trail for several kilometers along Highway 6, past Mazor, an archaeological site which still includes a 3rd-century Roman mausoleum. 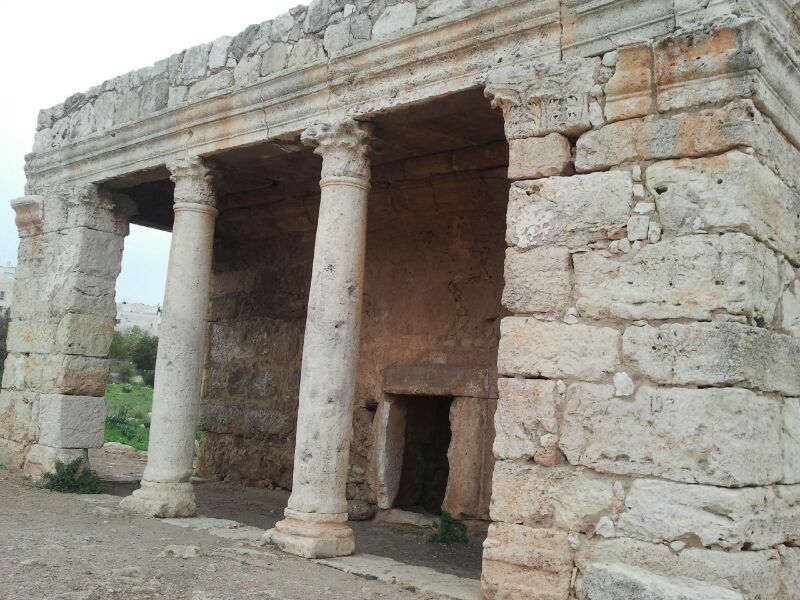 The mausoleum is the only Roman era building in Israel to still stand from its foundations to its roof. We went across the highway near the entrance to El'Ad. The trail took us around the outside of the town of El'Ad and into the Kula forest. This forest links the Coastal Plane with the lower part of the Samaria Mountains. The land was highly populated during most historical periods because of the arable areas and fertile soil of this geographical area. This was the most scenic part of our day and the only part of the day's trail that wasn't flat The forest was lush and green and rocky, the trail took us up an incline. 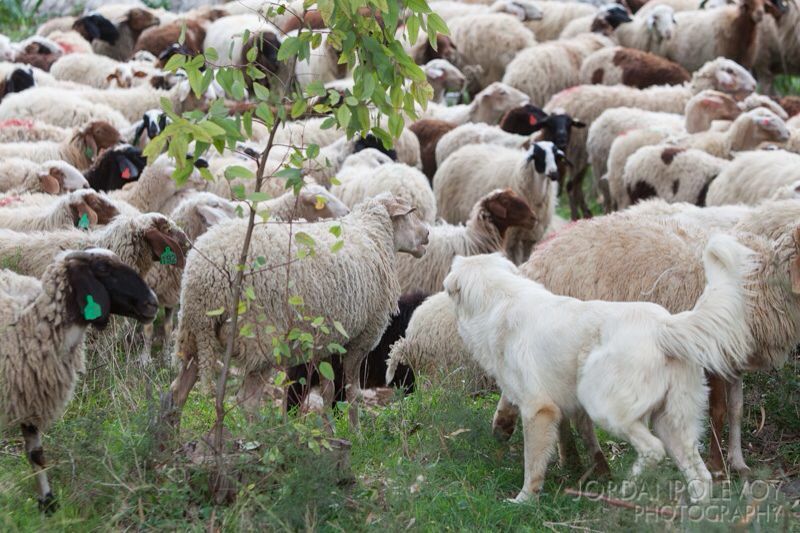 Along the way we passed a shepherd tending his flock of sheep and goats. Our hike ended at road 465.